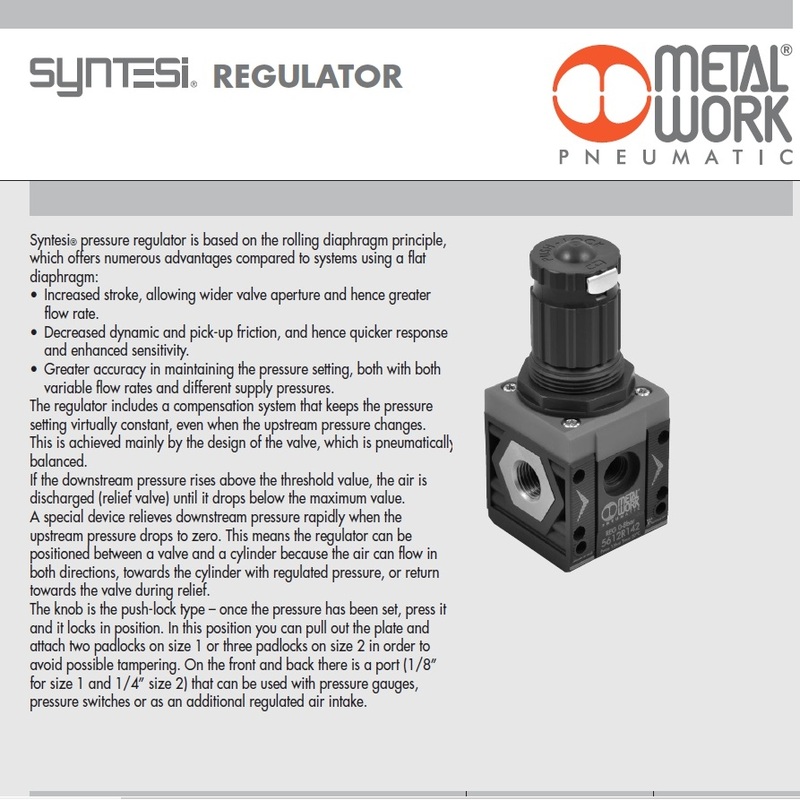 5624R164 Syntesi Pressure Regulator (Size 2) | DamenCNC B.V.
Syntesi® pressure regulator is based on the rolling diaphragm principle, which offers numerous advantages compared to systems using a flat diaphragm: • Increased stroke, allowing wider valve aperture and hence greater flow rate. • Decreased dynamic and pick-up friction, and hence quicker response and enhanced sensitivity. • Greater accuracy in maintaining the pressure setting, both with both variable flow rates and different supply pressures. The regulator includes a compensation system that keeps the pressure setting virtually constant, even when the upstream pressure changes. 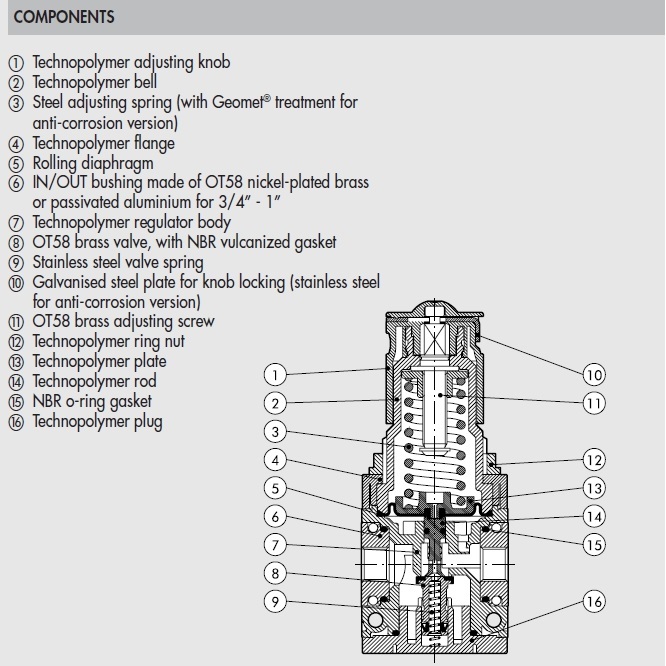 This is achieved mainly by the design of the valve, which is pneumatically balanced. If the downstream pressure rises above the threshold value, the air is discharged (relief valve) until it drops below the maximum value. 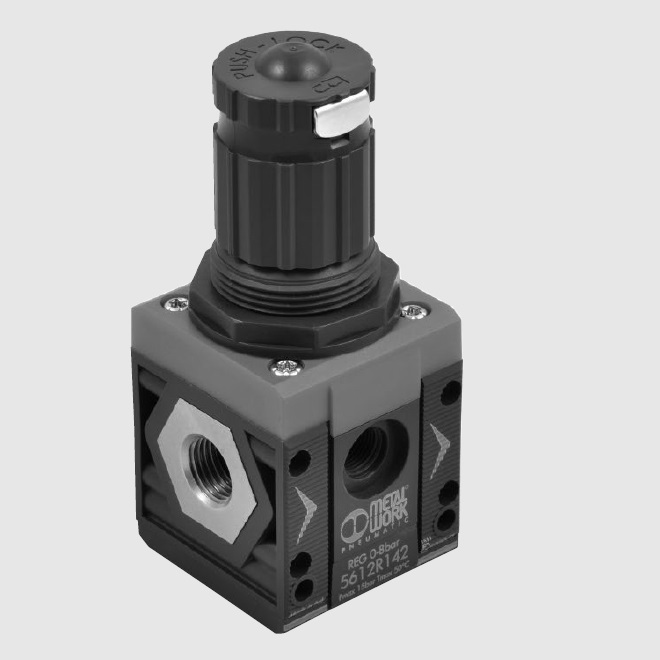 A special device relieves downstream pressure rapidly when the upstream pressure drops to zero. This means the regulator can be positioned between a valve and a cylinder because the air can flow in both directions, towards the cylinder with regulated pressure, or return towards the valve during relief. The knob is the push-lock type – once the pressure has been set, press it and it locks in position. In this position you can pull out the plate and attach two padlocks on size 1 or three padlocks on size 2 in order to avoid possible tampering. On the front and back there is a port (1/8” for size 1 and 1/4” size 2) that can be used with pressure gauges, pressure switches or as an additional regulated air intake.